Moses’ and the elders’ visions of, and encounter with, God; the patriarch’s prolonged engagement with him on the mount; and, finally, Moses’ radiant return to the people. The source material is made up of engravings of an inscribed biblical text, a spoken version of the same, and an audio bitstream derived from two pictorial prints illustrating the account of Moses on Mount Sinai. The texts on which the artwork is based are derived from the principal clause of the second commandment, forbidding the making of graven images (Ex. 20.4). One of the texts is a translation taken from Bishop William Morgan’s (1545­–1604) Welsh Bible (1588): ‘Na wnait ddelw gerfiedic, na llun dim a'r [a sydd] yn y nefoedd oddi vchod, nac a'r y [sydd] yn y ddaiar oddi isod: nac a'r [y sydd] yn y dwfr odditann y ddaiar.’ The other is taken from the Authorised Version of the Bible (1611): ‘Thou shalt not make unto thee any graven image, or any likeness of anything that is in heaven above, or that is in the earth beneath, or that is in the water under the earth.’ The term ‘graven’ is an approximation of the Hebrew word pesel, which means ‘to cut or ‘to hew into shape’. The English translation ‘graven’, as the translators of the Authorised Version understood it, is a fairly anodyne term that means ‘engraved’. This is the rendering that I have followed. 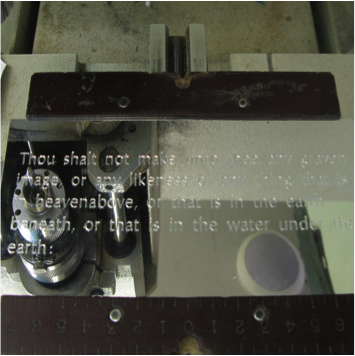 Two commercial plaque makers mechanically engraved the texts upon a metal matrix. The English translation was incised and recorded in 2010; the Welsh translation, on a different engraver, in 2015. (Two languages, two machines running at different speeds and making entirely dissimilar sounds, recorded five years apart). 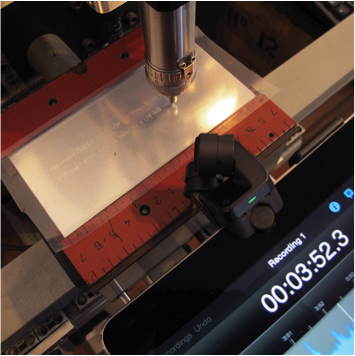 The earlier engraver produced an aggressive, rasping sound, and a deep cut in the plate. The later machine’s sound is muted, soft, and organic, and its cut, in turn, more delicate in contrast. Both source recordings were are slowed down by nearly 400%, thereby enlarging the original length of each to exactly twenty minutes duration. Here, the number 20 is symbolic, representing 2 × 10 (being, according to some traditions, the number of commandments inscribed by the finger of God on each of the two tables of the law (Ex. 31.18)). The stretched versions of the source were then modified through a network of synthesizer filters in order to generate tonal characteristics appropriate to the general mood of the text and its context – which is one of threat, awe, and gloom. The texts were also spoken: in Welsh, by a woman, and in English, by a man. A recording was made of both at the National Screen and Sound Archive of Wales, and subsequently transferred to two copies of a 33-rpm vinyl disc. These was produced, following the traditional mode of manufacture, by an intaglio process of incising a groove ­– within which the sonic information is embedded – into acetate, in the first instance. By this means, the spoken texts, too, were converted into engravings. 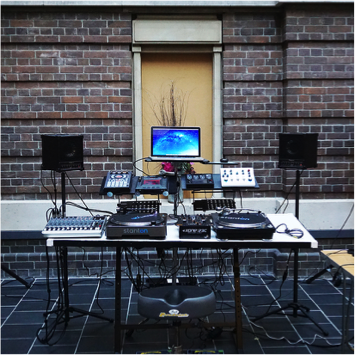 In the context of the open-studio event, the discs were manipulated on two DJ record player decks operating in parallel. The resultant sound was filtered through a series of samplers and digital and analogue filters, so that fragments of speech could be repeated, overlaid, and otherwise combined in ways that were not native to the recording, and their tonal qualities and volume, altered. Mount Sinai was a noisy place when Moses made his several ascents. Thunder rumbled, and there was also ‘the voice of the trumpet exceeding loud [that] … sounded long, and waxed louder and louder’ (Ex. 19.16–19). God permitted the people of Israel to ‘listen in’ on his dialogue with Moses and to overhear God’s voice (which also must have been at a fearful volume) as he pronounced the words of the Decalogue (Ex. 19.9; 20.1–19). 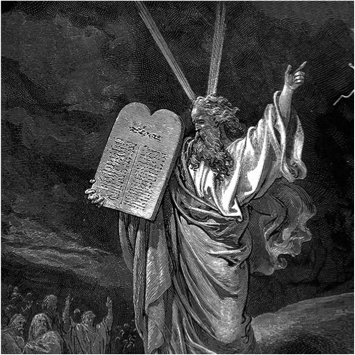 Thus, the Ten Commandments were, first, sounded out – as an ephemeral speech act – prior to becoming a text, one that would, in turn, become a permanent ‘image’ – inscribed on two stone tablets (Ex. 24.12). On the occasion of receiving the tablets, Moses remained on Mount Sinai for forty days and nights. In the Judaeo-Christian tradition, the number 40 is associated with, among other things, times of trial, testing, and judgement (Gen. 7.12, Matt. 4.2). My decision to create the composition over twenty-four consecutive hours was in order to honour the idea of a personal and demanding trial, which Moses had endured. ​The two pictorial engravings depicting Moses on Mount Sinai were, like the source texts, taken from a Welsh and an English version of the Bible: Bibl yr Addoliad Teuluaidd [n.d] and Imperial Family Bible (1844), both in the collection of The National Library of Wales, Aberystwyth. Digital renderings of the source images were converted into a bitstream, using a process called databending. In this way, the media file is made playable on sound-editing software. The resultant ‘noise’ was manipulated to create material that could be incorporated into the compositions, along with the sounds derived from the metal matrix and vinyl engravings.resultant ‘noise’ was manipulated, digitally, to create material that could be incorporated into the compositions, along with the sounds derived from the metal matrix and vinyl engravings. In returning one of the Ten Commandments to the condition of sound (noise and speech), the composition reverses the process by which it first came into being, and evokes the acoustic character of the context of the Decalogue’s original reception. The people are camped before the mount. 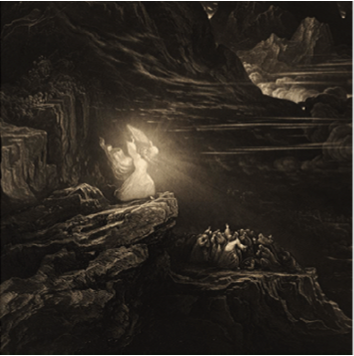 Moses ascends the mount to speak with God (Moses’ 1st ascent). God calls to Moses out of the mount. God establishes a covenant between himself and his people. Moses returns from the mount and speaks to the people (Moses’ 1st descent). The people pledge to uphold God’s covenant. Moses returns their decision to God (Moses’ 2nd ascent). God commands Moses to sanctify the people, and issues warnings regarding the inviolability of the mount’s perimeter. Moses speaks to the people and readies them for ‘the third day’. The people witness thunder, quakes, lightning, thick cloud, and smoke upon the mount. They approach the mount’s perimeter. A trumpet sounds long and progressively louder. God comes down upon the mount in fire (God’s 1st descent). Moses ascends the mount to speak with God (Moses’ 3rd ascent). Moses returns and speaks to the people (Moses’ 3rd descent). God declares the Ten Commandments. The people witness thunders, lightning, and thick darkness upon the mount, and hear a trumpet’s sound. He instructs Moses to set up of an altar to him on earth, and issues divers laws and ordinances to govern the people’s behaviour, as well as a further prohibition on image making. Moses returns to the people, recounts to them what God has decreed, and writes it down in a book (Moses’ 4th descent). The people make a peace offering to God. Moses reads, and the people reaffirm, the covenant. Moses, Aaron, Nadab, Abihu, and the seventy elders ascend the mount to God (Moses’ 5th ascent (stage 1)). They have a vision of God and clear sapphire stone. God promises to give Moses two stone tablets with the commandments written upon them. Moses and Joshua go further up into the mount (Moses’ 5th ascent (stage 2)). Cloud covers the mount for six days. God calls out of the cloud to Moses, while the people see God’s glory ‘like a devouring fire’. God describes the design of the Tabernacle and its appurtenances, gives instructions regarding the consecration of the priests, and inaugurates a Sabbath observance. He presents two stone tablets to Moses, with the commandments written upon them. The people, perceiving Moses’s delay on the mount, fashion from molten gold earrings an idol representing a calf. They make a peace offering to it, and hold a feast. God tells Moses about the people’s idolatry and threatens to destroy them. Moses remonstrates with God and urges him to repent of his intent. Moses and Joshua return to the people (Moses’ 5th descent). Joshua hears them shouting; they sound ‘like a noise of war in the camp’. Moses and Joshua approach the camp, hear the people singing, witness them dancing, and also see the golden calf. In anger, Moses breaks the tablets and burns the calf. Aaron tries to excuse the peoples’ sin. The sons of Levi are told to slay the idolaters. Moses ascends the mount to speak with God (Moses’ 6th ascent). He laments the people’s sin, and beseeches God not to destroy them entirely. God determines to send an angel before the people to punish them. Moses returns God’s judgement to the people (6th descent). God issues a warning against the people. Moses pitches the Tabernacle outside the camp. A cloudy pillar descends to the door of Tabernacle, where God speaks to Moses (God’s 2nd descent). Moses appeals for God’s grace and a sign of his favour. In response, God promises to reveal his glory to Moses. God commissions Moses to hew two new stone tablets to replace those that he had broken. Moses ascends the mount to speak with God (Moses’ 7th ascent). God descends to Moses (God’s 3rd descent). He passes before Moses, and renews his covenant with the people. God warns the people not to compromise with their enemies, and commands them to destroy their idols and shrines while restating once more the prohibition on image making. He issues various regulations and observances. Moses writes the words of the covenant on the new tablets. His face shines as a result of a forty-day and night confrontation with God. He returns to the people with the new tablets (Moses’ 7th descent). The people see that the skin of Moses’ face shines, and are afraid. Moses recounts God’s commandments to them. Moses veils his face when speaking to the people, and removes the veil when talking with God. Instrumentation: Adobe Audition CS6, Apple MacBook Pro OS X 10.8, Allen & Heath Xone:23C mixer, Apple MacBook Pro, Apple iMac OS X 10.11, Korg Kaoss Pad KP3 and Kaoss Pad Quad, metal matrix engravers, Moog MF-101 Low Pass Filter, Moog MF-102 Ring Modulator, Moog MF-103 12-Stage Phaser, Moog MF-104M Analog Delay, Moog MF-105 Midi Murf, Moog MF-108M Cluster Flux, Roland SP-404 SX Linear Wave Sampler unit, Sherman Filterbank 2 filter unit, Sherman/Rodec Restyler filter unit, and Stanton S-150 record turntable. Source: The metal matrix engravings of the text were made at Aberystwyth Trophies and Merlin’s Services, Aberystwyth, March 13, 2010, and April 20, 2015, respectively. The readings of Exodus 20.4, by Timothy Cutts and Ceridwen Lloyd-Morgan, were recorded at the National Screen and Sound Archive of Wales, The National Library of Wales, Aberystwyth, June 22, 2015. 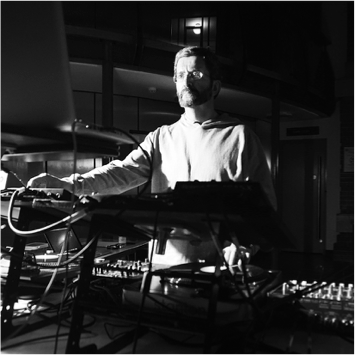 An audio manipulation of those recordings was undertaken during a 24-hour open-studio event held at the Drwm, The National Library of Wales, September 24–25, 2015.